The postponed first round fixture between Rathgormack and Ballinameela was played on Friday night last. Result = Ballinameela 1-9 Rathgormack 0-7. Back Row (L to R): Joey Mullen, John Gorman, Declan Enright, Eoin Brackett, Martin Lavan, Patrick Hurney, Jonathan Moore, Shane Delahunty, Gary Hurney, Gavin Breen, Stephen Enright, Colin Keane, Seán O'Hare, Michael O'Halloran, Ian Kiely, James Hayes, Richie Ryan, Laurence Hurney, James O'Mahony. 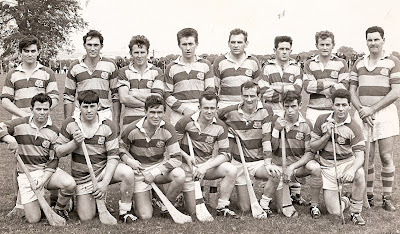 Front Row (L to R): Patrick Lynch, Tom Hanrahan, Shane O'Donovan, John Hurney, David Power, Brian Scanlon, Mark Fives, Declan Fives, Stephen Slater, John Phelan, John Foley, Tiernan Murray, Mark Gorman, Mark Ferncombe, John Kindregan. This week's photo brings us back to 2008 and the Ballinacourty panel that contested the County Senior Football Final at the Fraher Field. Wins over St. Saviour's, Brickey Rangers, Kilrossanty, An Rinn and Stradbally set up a decider with the Nire. A 0-11 to 2-5 draw meant a return to the Shandon venue for a tight replay where the Nire came out on top on a scoreline of 0-12 to 0-8. Our popular Jack the Joker Fundraiser will continue this Sunday night in Kennedy’s Live where the Jackpot will be €10,836 as on Sunday night JJ Whelan was drawn out of the drum but did not find the Joker, however she did win €50, while “Tom The Chef” and Paudie Kiely won €25. The following are the numbers that haven’t been turned yet 3, 9, 11, 12, 17, 18, 23, 30, 32, 39, 40, 41, 43, 44, 45, 47, 48, 49, 50, 51, 52. On Saturday evening last we recorded our second win of the County Championship as a very good team performance saw us defeat Rathgormack. TEAM: S. ENRIGHT, D. COLLINS, R. SHEEHAN, S. BRIGGS, P. LYNCH, S. O’HARE, J. HURNEY, R. DUNFORD, J. O’MAHONY, M. FERNCOMBE, G. HURNEY, M. O’HALLORAN, P. HURNEY, M. FIVES, J. O’BRIEN. This Sunday morning we play Roanmore in the County League in Roanmore at 12pm. Our Bingo continues this Sunday night in the CBS Hall where the jackpot is €500. A duck race will take place on Davitts Quay on Sunday the 6th of May at 5:00pm. Ducks cost €3 and can be purchased from any committee member. All proceeds go to the juvenile club. The Kellogg's Cul camp takes place from July 1st to 5th this year for boys and girls from age 6 and up. Registration can be done on line at Kellogg's Cul Camps or by contacting your club co-ordinator Carmel on (087) 2598923. Our under 16 hurling team have been quite busy of late. They travelled to Passage on Monday of last week and played at home to Cois Brid on Thursday last. On Monday after a lacklustre display against Passage morale was low and we were heavily defeated. However pride was restored against Cois Brid on Thursday and after a very battling performance our lads got a deserved draw. Our last game of the year will be played at the time of going to print and we will give the result of this tie due to have been played on Monday last at home to De La Salle next week. Our under 11 team took part in another round of the town and country league last Friday night and came away with a very narrow win over Dungarvan. Our under 12 hurlers are due to play Lismore this Friday night in Lismore. Our under 14 hurling Feile team played the first round of their championship last weekend against the Brickies and played some nice hurling to record a victory. They are now due to play the western semi final of the same competition tonight (Wednesday). Camogie training continues every Tuesday evening from seven until eight for u12 and on Fridays from 6-30 to 7-30 for all age groups. This Friday the 26th our registration evening will take place in the club house from 6-30 onwards those who wish to join for the coming season are asked to come along new members are always welcome. Our U14s played their first game last Tuesday evening at home to St. Molleran’s. This was a big step up for the girls as it was our first year entering at U14. Molleran’s were a very strong side and came away with the win. This Tuesday evening see the girls travel to Ring in their second game full match report next week. The joker tickets can be purchased through the club for just €2 and with the jackpot now well over €10,000 if you’re not in you can’t win. We hosted very successful blitz on a lovely sunny morning last Saturday. St. Molleran’s played An Rinn in the first game and held on to a first half goal for a deserved win. Our girls played two matches with St Molleran’s, edging a keenly contested first game by a goal. We lost hard pulling Ellen Power to injury for our final against An Rinn. This proved to be just as close with the sides level at half time until Abbeyside began to get on top and a goal by Catherine Ruane after a goalmouth scramble midway through the half had the home side in front. An Rinn battled hard and every ball was contested with Ellen Regan, Moya Kiely and Katelyn O’Brien Landy defending superbly with Siun Ni Mhurchu, Caoimhe Earley & Laura Cosgrave in the thick of everything. It was end to end for the rest of the second half until Amy Kennedy scored a great team goal for Abbeyside to seal the victory. Thank you to all players, coaches, refs and parents who helped make this a very successful blitz. Back Row (L to R): B. O'Connor, M. Kiely, J. Power, J. McGrath, A. Flynn, T. Mansfield, R. Cashin, D. Whelan. Front Row (L to R): D. Flynn, L. Cummins, J. Cosgrave, P. McGovern, P. Enright, J. Flynn, P. Hogan. This week's photo shows the Abbeyside Senior Hurling team that qualified for the County Final in 1969. 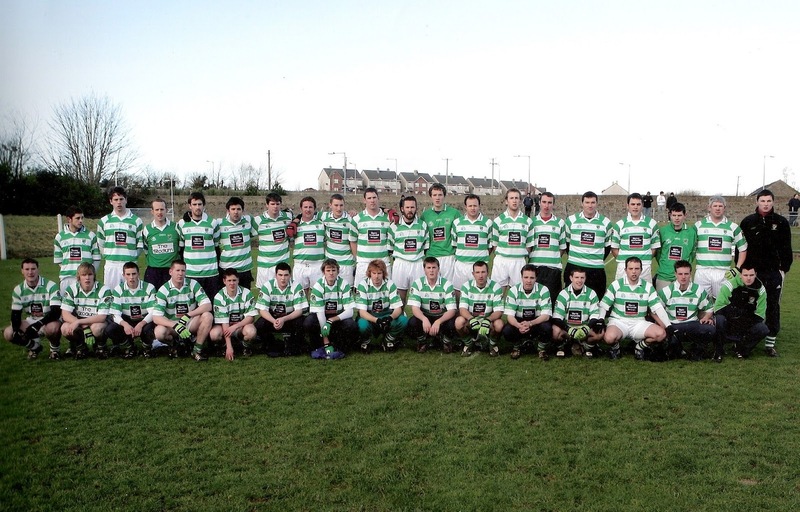 Early victories over Dunhill and Ballyduff-Portlaw saw the Villagers face champions Ballygunner in the semi-final. A comprehensive 3-17 to 3-4 win set up another final appearance against Mount Sion. Unfortunately, the hoodoo of the Monastery men continued as the city side ran out 7-11 to 2-13 victors at Walsh Park. Our popular Jack the Joker Fundraiser will continue this Sunday night in Kennedy’s Live where the Jackpot will be €10,500 as on Sunday night Brian O’Connor was drawn out of the drum but did not find the Joker, however she did win €50, while Seán O’Hare and Seán McGrath won €25. The following are the numbers that haven’t been turned yet 3, 9, 11, 12, 17, 18, 23, 30, 32, 39, 40, 41, 42, 43, 44, 45, 47, 48, 49, 50, 51, 52. We got our Championship campaign off to a winning start on Friday night last thanks to a 1-09 to 0-09 victory over Ring in Fraher Field. TEAM: S. ENRIGHT, D. COLLINS, R. SHEEHAN, S. BRIGGS, P. LYNCH, S. O’HARE, J. HURNEY, R. DUNFORD, J. O’MAHONY, C. MOLONEY, G. HURNEY, M. O’HALLORAN, P. HURNEY, M. FIVES, J. O’BRIEN. SUBS: M. FERNCOMBE, S. O’DONOVAN. This Saturday night we play Rathgormack in Fraher Field at 7:30 pm. On Sunday afternoon last we played our first game of the Western Championship where unfortunately we were defeated by Clashmore in Fraher Field. TEAM: R. RYAN, D. DEE, J. MOORE. C. HICKEY, E. BERGIN, T. HANRAHAN, M. POWER, E. ENRIGHT, L. HURNEY, J. POWER, N. DEE, S. CROTTY, D. POWER, D. FERNCOMBE, J. FOLEY. SUBS: E. COLLINS, J.P. McGRATH. Our Bingo continues this Sunday night in the CBS Hall where the jackpot is €450. Outdoor training was due to begin on Saturday morning last for the under 6 team up as far as under 10. However due to bad weather this training had to be cancelled. It however will now start this Saturday morning between 10:30 and 11:30am. Our under 16 hurlers were due to play their second game in the county championship on Monday last away to Passage. At the time of going to print this result was not available and it will be included in next week’s notes. This group also are out in the third round of the championship at home to Tallow on Thursday at 7 pm. Congratulations to everyone involved in our under 14 Feile Peil team who won the county championship last Wednesday night in the Fraher Field where they defeated Gaultier. This was a tremendous performance by all involved and this team has now qualified for the National Feile Peil tournament in Derry in June. On Saturday this team again took to the field and played St Pats in the Western final. Being a little tired after their exploits on the Wednesday before we lost this game by a point to a very determined St. Pat’s outfit. We wish them all the best in the county final. To our players congratulations must go also after an outstanding year in football and we would also like to thank their mentors for all the hours there after putting into this team. Training for the hurling championship now starts and we wish this group well for the rest of the year. Our U8 panel travelled to Carriganore on Saturday last to take part in a football blitz. On a very wet and windy day the boys were divided into two teams of ten and played two games each with the third for each group cancelled as the day just got worse. Fair play to the boys who togged out, although wet and cold they enjoyed it. Better days ahead lads. Training continues every Saturday 10.30 to 12pm unless you hear different. Congratulations to all involved with the Friary College Superschools team who won this event in Wales last week. Involved from the under 16 panel in Wales were Rory Conway, Darragh McGrath and David Looby. Also we would like to congratulate Dungarvan CBS on winning the All Ireland Senior Hurling B title last weekend. Training continues every Tuesday evening at 7:00pm to 8:00pm for under 12s and on Fridays for all other age groups from 6:30 to 7:30.